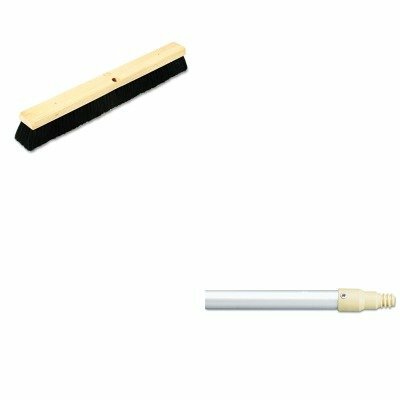 KITBWK20224RCP6355GRA - Value Kit - Boardwalk Floor Brush Head (BWK20224) and Rubbermaid-Gray Aluminum With Plastic Threaded End (RCP6355GRA) by Boardwalk at Blog Free Here. MPN: BWK20224RCP6355GRA. Hurry! Limited time offer. Offer valid only while supplies last. lt;stronggt;BWK20224lt;/stronggt;lt;BR/gt;Boardwalk Floor Brush Headlt;BR/gt;Hardwood block with two threaded handle holes. Handles sold separately. lt;stronggt;BWK20224lt;/stronggt;lt;BR/gt;Boardwalk Floor Brush Headlt;BR/gt;Hardwood block with two threaded handle holes. Handles sold separately. For fine/medium sweep. Tampico fibers resist heat and chemicals. Bristle Material: Tampico Fiber Brush Length: 24amp;quot; Bristle Length: 2 1/2amp;quot; Bristle Color: Black.lt;BR/gt;lt;BR/gt;lt;stronggt;RCP6355GRAlt;/stronggt;lt;BR/gt;Boardwalk Floor Brush Headlt;BR/gt;Strong shaft ensures durability. Threaded tip features a strip-resistant die cut. Standard sizing allows you to use nearly any common floor sweep. Vinyl grip and plastic tip. Handle Length: 57amp;quot; Handle Diameter: 1amp;quot;.